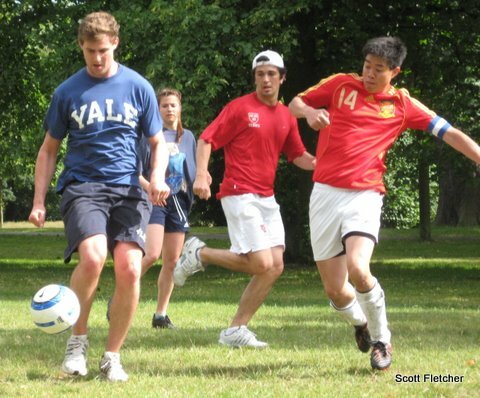 The annual Yale – Harvard co-ed football (or soccer, if you must) game will be at 2pm on Sunday, June 13th at the Battersea Park all-weather sports pitches. http://www.wandsworth.gov.uk/NR/Wandsworth/images/battmap.gif. Tube stop: Sloane Square, then walk or take a bus 137 or 452 over Battersea bridge (or take bus 44 from Victoria, more bus options here). Allow 20 minutes from Sloane Square to reach the pitch. The match will be 11 vs. 11. Only sneakers or astroturf shoes can be worn (i.e, no studs). If you're interested in playing, please contact Kerem Turunç: kerem.turunc@aya.yale.edu. All skill and fitness levels welcome! Even if you don’t play, come cheer on the Yale team; there is plenty of seating pitchside!